About audio progression, new game screens and a a little story about how hard can t be to implement some mini games. The release of Doctor Who : A Brilliant Game is sooner every day, but we manage to be ready for the big launch on the 30th of December. The delightful episode "The Time Of The Doctor" is now in every fan's head, and it's our task to bring you back to the movie that was released a month ago. 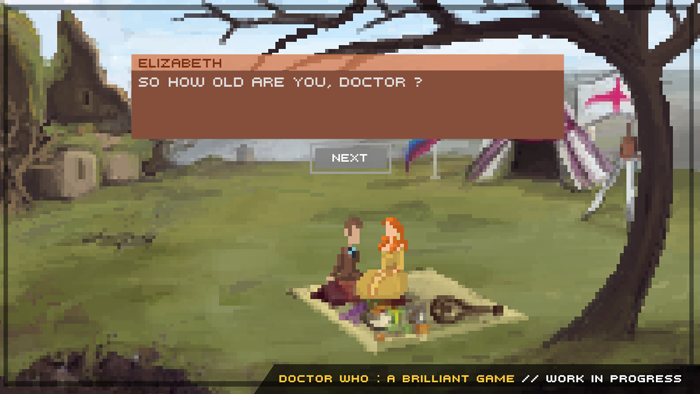 Are you already forgetting the geeky and charming Tenth Doctor with Elizabeth ? The picnic scene, with Elizabeth the First. Leading to a very original Mini Game...Don't eat too much ! Did you make your goodbye to the Eleventh Doctor ? Why not, but he is still here ! 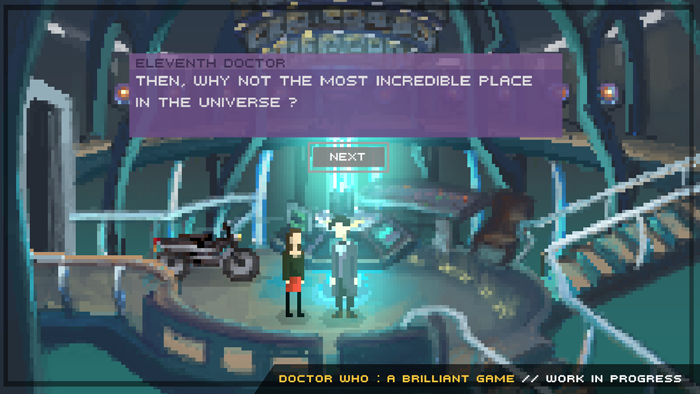 Clara and The Doctor in the Tardis, updated ! And finally, a mini-game that I was struggling with, since no camera has been made for the game (meaning, no parallaxe and long horizontal panoramas), the klaxon scene was a bit hard to implement. 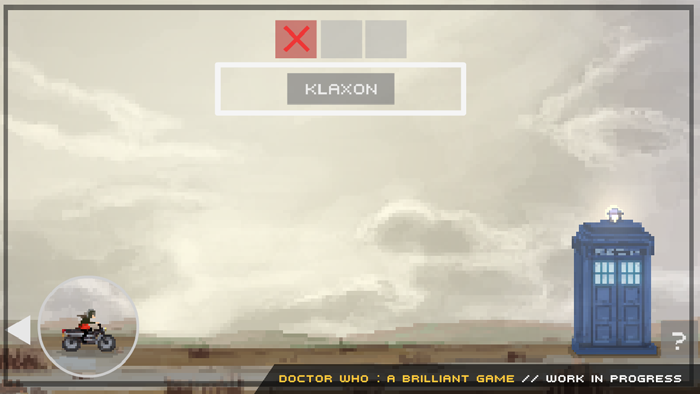 The player didn't get time to push the klaxon button that Clara was already hitting the Tardis. So here is some idea taken from Super Smash Bros (sorry for the reference, I know there aren't the one who invented that idea, but I don't find other examples in my busy brain). For the first audio tests, it's here. Thanks for your patience, and enjoy your holidays (if you have some). How do you make it look like this? I mean, this could have been on C64, which I think was the intention. However, I wouldn't know how to downscale anything to look this pixelated. Is it just taking down the resolution, or what is the process here? Looks great! I love this kind of adventure, and I think we need moar like it!